I’m pregnant! Maybe you hadn’t heard the news quite yet, so there you have it. 🙂 I’m due in late May, but since this is my sixth child, the belly has a way of making itself shown early. ha! That also means that all of the maternity clothes I gave away after the twins were born are sorely missed right now. Before I get into my post, I want to make sure you all know about the 5 out of 4 10k giveaway that is happening right now in the 5oo4 Patterns Group on Facebook! 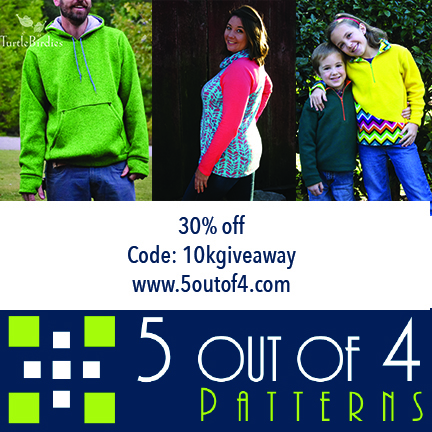 We have daily giveaways, an awesome grand prize, and all patterns on sale for 30% off with the code 10kgiveaway through January 15th! So, I thought I would share with you some of my favorite 5oo4 Maternity mods. 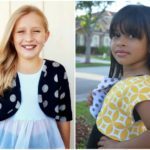 I LOVE our patterns that already include maternity modifications. 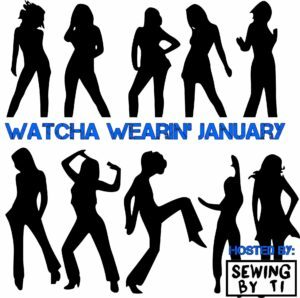 Did you know that 12 out of 16 of our women’s patterns already have maternity modifications included in them and there is even a section JUST to focus on maternity patterns? 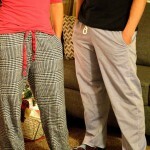 Of the 4 that don’t include it, one is the free woven pajama pants pattern. While it’s not technically “maternity”–I wear mine every week. I cut it on the low waist option and don’t have any issues. The others than don’t include maternity options are the Resolution Bra and Tank, Weekender Tunic, and the Women’s Ascent Fleece Pullover. I honestly believe that all of those can be easily modified to be maternity if you wanted them to be and the Women’s Weekender Tunic has enough ease in it to where you don’t even need to make that many mods until the 3rd trimester. The drawing above shows a typical maternity modification (the dotted lines). 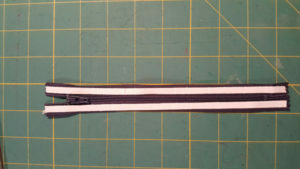 I add about 4-5″ onto the length of the front and about an inch tapering to 0″ at the side seams of the front. If I’ve dropped just the center front, then the side seams are still the same length. However, lately I’ve preferred to drop the side seams 4-5″ as well. Then I gather the sides of the front to equal the side seams of the back. That’s it. 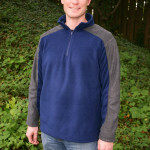 I’ll show you how I did it with the Women’s Ascent Fleece Pullover. I LIVE in fleece pullovers during the winter when I’m not pregnant, so I really wanted to make myself at least one of these that was maternity friendly. The first thing I did with my Ascent pattern was lengthen the front bodice by 5″ and taper the side seam like I showed in the drawing. I tend to carry BIG babies, so I like to alter the side seam to try and keep it straight. Then I sew a basting stitch on my side seam from right below my bust to about 2″ above the hem. I pull the threads to gather the front side seams to match the back side seams, pin, and then sew the side seams together. After that, I just sew up the rest of the pattern as written. 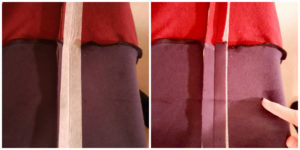 The only other change I made was using twill tape to cover up the seam at the neckline. This is about the most tedious thing I’ve ever bothered to do, but I love the pop of color with the zipper and the twill tape. For my second maternity mod, I played with an idea my husband had for the Halftime Hoodie. I used to coach basketball, so I have a lot of hooded sweatshirts. I don’t mind the oversized look, but when I’m pregnant, I like to show off my baby bump. 🙂 That’s hard to do in a men’s hoodie. 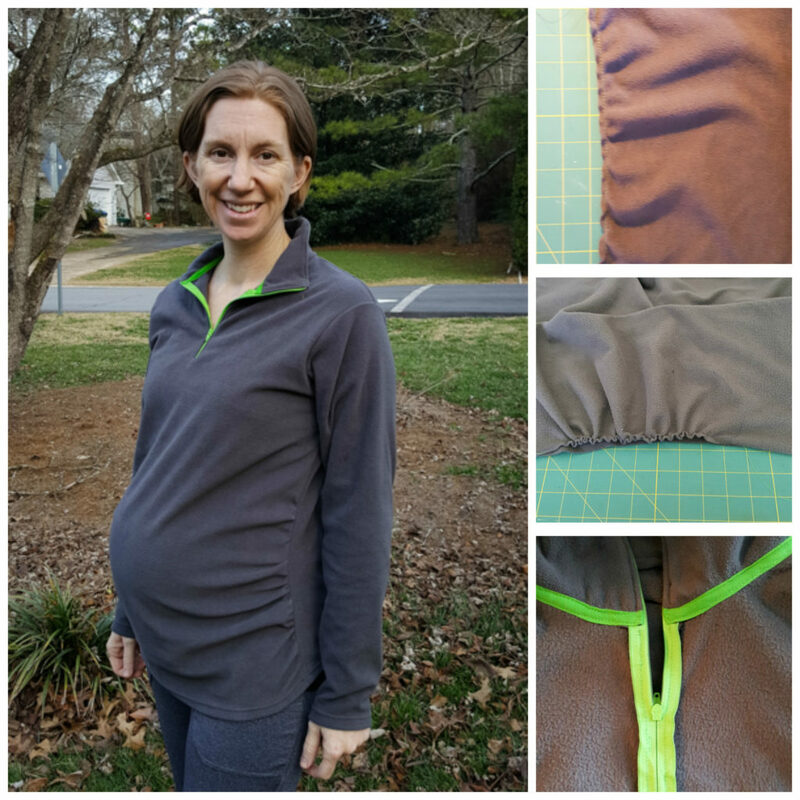 I had a vision of using zippers on the side seams of the Halftime Hoodie so that it was a little more maternity friendly (instead of just making a larger size to cover my belly). 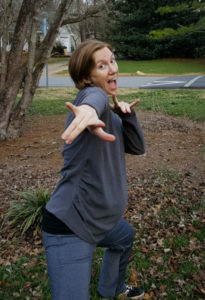 I picked my size based on my bust (size small) and then lengthened the front AND back 5″ and didn’t alter the side seam at all because the Halftime Hoodie has quite a bit of ease in it. I went ahead and ironed the front and back band in half to get a crease. Then, I opened it back up and attached it to the front and back separately (and left the bottom of the band open instead of folded the way it’s typically done). I did this so I could sandwich my zipper in the band. After attaching the bottom band, I sewed up the side seams of the bodice with a basting stitch and ironed the seam allowance open. 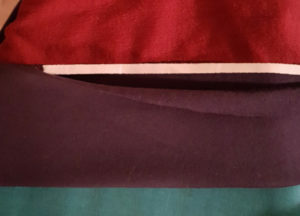 I ironed lightweight fusible interfacing to either side of the seam allowance so that it was on the inside of the sweatshirt and the seam allowance on both sides of the seam. I wanted it on the bodice material (and not just the side seam) because I was going to be using my zipper foot instead of my walking foot, and I didn’t want the fabric to stretch as I was topstitching my zipper. I love Washaway Wonder Tape for installing zippers. Instead of basting my zipper to the seam allowance, I line both sides of the zipper with Wonder Tape. Then I center the zipper over the seam. I stopped the zipper where the bottom band would fold (I’m pointing to the crease). Then I used Wonder Tape on the seam allowance to fold the band up and sandwich the zipper in the band. I use a few pins just to really make sure that everything stays put. I also like to use a 1/2″ piece of clear tape on the right side of my seam as a stitch guide. It’s just another way my perfectionism slows me down. 😉 If you center the tape on the seam, it’s the perfect stitch guide for sewing in your zipper. 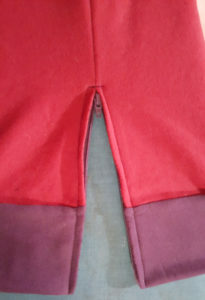 After topstitching the zipper, I remove the basting stitches over the zipper and re-sew the side seams. Try and get close to the bottom of the zipper. Then I used wonder tape again on the inside of the band to tape it over the hem between the bodice and the band. I topstitched with my coverstitch machine (or you can use a zig-zag or stretch stitch here). So, a couple of thoughts on this. It didn’t really turn out the way I was envisioning. I shouldn’t have lengthened it. I think in my head, I was picturing a sweatshirt getting a little too tight and then the zippers creating vents for more room in the late stages of pregnancy. What I ended up with was a tunic that is still a little too tight in the abdomen and the zippers are cute, but non-functional! I think if I shortened it, I could get it to work. Or I could embrace the funky sweatshirt dress with zip vents…for at least a few weeks before it’s too tight?! As for the pants I’m wearing in these pictures, these are a NEW pattern that should go into testing some time in the next few weeks! They have structure, look like real pants, but feel like yoga pants. I LOVE THEM. This is (obviously?) ONE of the maternity options. I’m hoping to include high, mid, and low rises and then the maternity option can look like this OR have an over the belly panel! WOOT! 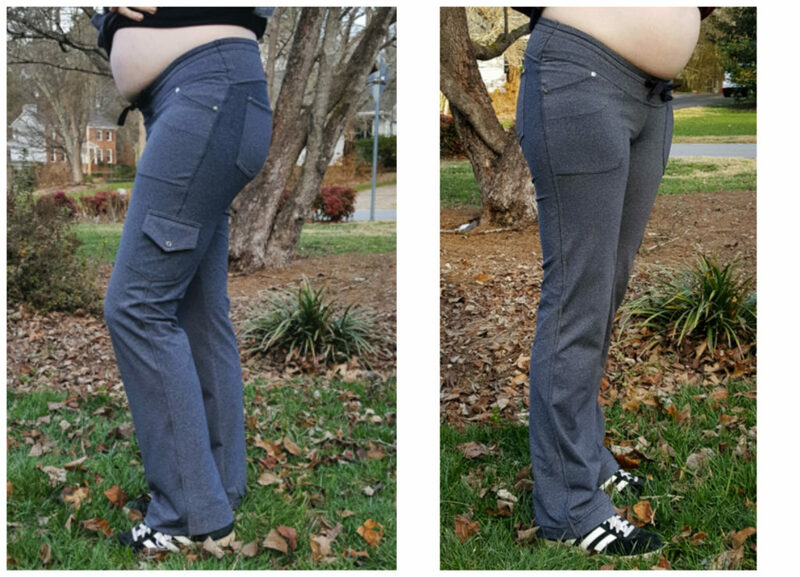 The non-maternity versions will sport a contoured waistband with both elastic and a drawstring for a perfect fit. Prize pack #1: 28 patterns, $100 in store credit to Raspberry Creek Fabrics and a $20 gift card to Mummykins and me. Prize pack #2: 28 patterns, $30 credit to posh prints, $25 credit to You made something, $20 credit to P4P AND 2 yards art gallery fabric +1 coordinate from NR fabrics. And now, here are the details for the incredible prizes! To enter for Prize Pack #1, click on this link to the Rafflecopter page and follow the links to gain entries in the Rafflecopter draw. 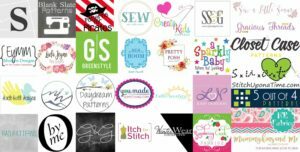 $100 store credit to Raspberry Creek Fabrics to buy fabric to start sewing up your new patterns! To enter for Prize Pack #2, head on over here and share a link to a picture of you wearing one of your me-made creations! You can link up once per day so that gives you 31 possible entries!!! And of course more fabric to sew up your new patterns! Excited for the pant pattern, I’ve been looking for something like that ???? I’m sure a lot of pregnant mamas will appreciate these maternity mods. Congrats on the newest little one. Cute maternity mods although I’m long past the maternity stage. You have amazing maternity patterns!